The Neotropical frog genera Ceratophrys, Chacophrys and Lepidobatrachus form the monophyletic family Ceratophryidae. Although in- and out-group relationships are not fully resolved, the monophyly of the three genera is well supported by both morphological and molecular data. Much is known about the morphology of the ceratophryids, but there is little comparative information on how modification of a common ancestral developmental pathway played a role in shaping their particular body plans. Herein, we review morphological variation during ceratophryid ontogeny in order to explore the role of development in their evolution. The ceratophryids are collectively characterized by rapid larval development with respect to other anurans, yet the three genera differ in their postmetamorphic growth rates to sexual maturity. Derived traits in the group can be divided into many homoplastic features that evolved in parallel with those of anurans with fossorial/burrowing behaviors in semiarid environments, and apomorphies. Morphological novelties have evolved in their feeding mechanism, which makes them capable of feeding on exceptional large prey. Lepidobatrachus is unusual in having reduced the ecomorphological differences between its larvae and adults. As a result, both the larvae and the frog are similarly able to capture large prey underwater. Some unique features in Lepidobatrachus are differentiated in the tadpole and then exaggerated in the adult (e.g., the posterior displaced jaw articulation) in a manner unobserved in any other anurans. Based on morphological and molecular data, the South American anuran genera Chacophrys Reig and Limeses 1963 (one species), Ceratophrys Wied-Neuwied 1824 (eight species) and Lepidobatrachus Budgett 1899 (three species) constitute a monophyletic clade, the Ceratophryidae. Ceratophrys species are distributed in tropical areas with Ceratophrys cranwelli living with Lepidobatrachus spp. and Chacophrys pierottii in the semiarid lowlands of the Chaco region. The monophyly of the group, often referred to as horned frogs, was proposed by early researchers [1–5] and ratified by more recent cladistic analyses [6–10]. However, two controversies remain regarding the relationships of the group: (1) the relationships between the three genera and (2) the group’s relationship with other anurans. Studies of the Ceratophryidae have alternatively proposed the basal taxon to be Ceratophrys [5, 7, 9–11], Chacophrys  or Lepidobatrachus [1, 4, 8]. More recently, molecular data of the 12 extant species were reanalyzed within a large taxon sample, and the monophyly of Ceratophrys and Lepidobatrachus (Fig. 1) was corroborated . In this phylogeny, the monotypic Chacophrys sits as the sister taxon of Lepidobatrachus, but with Jackknife frequency <50 % (Fig. 1a). When the relationship of the Ceratophryidae to other anurans has been examined, the South American horned frogs have been variously proposed as: a basal taxon within Bufonidae ; related to Leptodactylidae [2, 4, 5] or to certain hylids, but with only weak support ; a basal group of Neobatrachia ; the sister group of Odontophrynus ; the sister group of Batrachyilinae ; the sister group of Telmatobiinae ; a sister lineage of a large clade within Hyloides  (Fig. 1b); and even a basal group of Hyloides . Two Cretaceous fossils have been attributed to the Ceratophryidae and are the oldest fossils associated with the family. These are Beelzebufo ampinga from the Upper Cretaceous (Maastrichtian) Maevarano Formation of Madagascar [13, 14] and Baurubatrachus pricei from the Upper Cretaceous of Brazil . Other more recent fossils have been placed within the Ceratophryidae. Specimen assigned to Wawelia geroldhi, from Miocene sediments of northern Patagonia in Argentina , seems to represent a juvenile anuran with some features like extant ceratophryids. Other late Miocene specimens have been attributed to Ceratophrys [17–20] and Lepidobatrachus [21, 22]. Those specimens, plus independent molecular data [5, 23], indicated that both genera were well differentiated by the Miocene. The adults of extant ceratophryids are characterized by medium to large body size (Fig. 2). The three genera share as well several derived morphological features associated with a terrestrial and fossorial life, plus adaptations for feeding on large prey [7, 10, 24, 25] (Fig. 1). The tadpoles of these genera are, however, remarkably distinct (Fig. 2). Ceratophrys spp. have macrophagous and specialized carnivorous larvae with robust keratinized mouthparts [32, 33]. Chacophrys has a more typical, generalized, suspension feeding tadpole [27, 34], and Lepidobatrachus larvae are obligatorily megalophagous , feeding upon living nekton, including other tadpoles. Lepidobatrachus tadpoles display many morphological features for capturing very large prey that are exceptional among anurans [30, 32, 35, 36]. The uniqueness of Lepidobatrachus tadpoles resulted from evolutionary changes in several specific developmental pathways that occurred simultaneously or sequentially from a generalized larval type [36, 37]. Despite much data supporting ceratophryid monophyly, the evolution of these anurans remains enigmatic. Although much is known about their morphology, there is little comparative information on how development played a role in shaping the divergent ceratophryid body plans. What in particular has not been explored is the interplay between pre- and postmetamorphic development. Uninvestigated is how these developmental pathways have influenced each other to arrive at their variously shared and unique features of adult and larval ceratophryids. Here, we review information on variation among ceratophryid ontogenies to address two interrelated questions: (1) How did modification of development pathways play a role in the differentiation of ceratophryid genera? and (2) How did those developmental pathways contribute to the evolutionary history that distinguishes the ceratophryid from the other hyloid lineages? We provide data to (1) illustrate how development can evolve and (2) present a case study of how the detailed knowledge of morphological variation during development strengthens evolutionary studies. From an ontogenetic approach, heterochrony has become a focal concept that integrates many areas of evolutionary biology . Different definitions, however, have been used to explain heterochrony (cf. “Appendix”), and controversies have emerged since heterochronic patterns cannot be unequivocally classified without information of the timing (age) of developmental events in the ancestral and descendant ontogenies . As heterochrony produces morphological changes in shape and size of a trait relative to the ancestral ontogeny, there are some useful concepts to describe heterochrony even when developmental timing is unknown [42–44]. 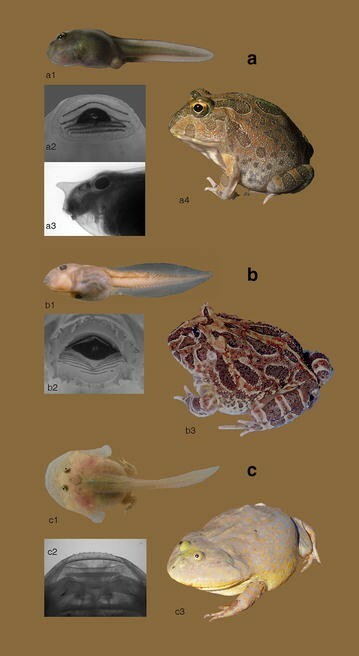 Sequence heterochrony and growth heterochrony facilitate the distinction between variation in shape (as development) and variation in size (as growth), and both, as noted below, appear to have occurred in the evolution of the Ceratophryidae, following the terminology (Fig. 3; “Appendix”), and they are consistent with the evolutionary processes of peramorphosis and hypermorphosis [7, 11, 50] (Fig. 4). The importance of growth heterochrony for distinguishing ceratophryids from other anurans was demonstrated in a comparison of the larvae from 20 species (five anuran families) that co-occurred with ceratophryids in the Chaco in South America. Data on size at metamorphosis and duration of the larval period for most non-ceratophryid species in this sample suggested similar growth rates , i.e., with development to metamorphosis taking between 20 and 75 days for 15 of those 20 species and larval body sizes varying between 9 and 25 mm. By comparison tadpoles of Chacophrys pierotii and Lepidobatrachus spp. reach metamorphosis between 15–18 days and Ceratophrys cranwelli in 20–24 days, with body sizes ranging from 25 to 45 mm  (Fig. 4). Precise data on age at sexual maturity and postmetamorphic growth rates are not available for any ceratophryids in the wild. However, it is possible to infer the age of reproductive adults from wild-caught specimens from lines of arrested growth. Such data suggest that developmental and growth rates after metamorphosis differ greatly among ceratophryids. In Lepidobatrachus spp., sexually mature individuals of 5–6 years are considerably larger than sexually mature C. pierottii of the same age . The ages for mature males of Ce. cranwelli vary between 11 and 14 years old with sizes slightly larger than those of Lepidobatrachus laevis at 6 years . In ceratophryids, accelerated differentiation and growth has also been described for many organ systems [11, 51]. An example is the early acquisition of mature skin features—i.e., three or more epidermal layers, a well-differentiated dermis, and a thick stratum compactum—in larvae of Ce. cranwelli and Lepidobatrachus spp. [11, 36] (Fig. 5). Furthermore, the size of the neuromasts appears to be related to these integumentary features, with larger organs present early in Lepidobatrachus spp. Conversely, small neuromasts are observed in species with typical larval skin, such as C. pierottii . In L. laevis, sequence heterochrony has led to the retention of the lateral line system through metamorphosis, with the size of the neuromasts similar to that of the larval stages . In anurans, with the exception of axial musculature that changes with metamorphosis, the appendicular musculoskeletal system develops and grows independently of the larval body plan . This can be understood within the context of modular organization of development [41, 55]. For developing anurans, the postaxial musculoskeletal system is divided into two separate units: (1) the trunk and tail that collectively serve for swimming and (2) the appendicular system that develops to serve adult tetrapod locomotion. In ceratophryids, there are a few derived features in the postaxial skeleton (Fig. 1b). These include the absence of a crest on the ilium, the presence of a very short muscle iliacus externus [54, 56], a strong prehallical element for digging and the presence of dorsal shields in some species of Ceratophrys and Lepidobatrachus [10, 24, 57]. A shortened muscle iliacus externus has evidently evolved many times within the hyloids (Fig. 6). The muscle is progressively diminished within Lepidobatrachus in the sequence L. llanensis, L. asper and L. laevis . The prehallux is formed by two elements: The proximal one is spherical and the distal one is axehead-shaped. The distal prehallux provides support for a keratinous “spade” used for burrowing by fossorial anurans. The distal prehallux has a pronounced dorsal process that develops early and is well defined before metamorphosis (Fig. 7). In addition to the ceratophryids, a prehallux with these features occurs in species within the genera Spea, Scaphiopus, Odontophrynus, Astylosternus, Arthroleptis, Hemisus, Scaphiophryne, Breviceps, Pyxicephalus, Rhinophrynus dorsalis and Neobatrachus pictus [59–64]. Notably, these taxa largely occupy semiarid regions, where burrowing by the frogs into the ground is protective against desiccation during the drier times of the year. Mineralized structures in the integument, such as a calcified layer, cranial co-ossification and dorsal shields on presacral vertebrae, have similarly been associated with reducing evaporative water loss in anurans [65–71]. Dorsal shields are rare among extant anurans, but have been found in some ceratophryids (Fig. 8), some brachycephalids and few dendrobatids [7, 14, 57, 72, 73]. Dorsal shields also occur in temnospondyl amphibians of the Paleozoic [65, 74]. In ceratophryids, dorsal shields develop via intramembranous ossification and differ from the dorsal shields in Brachycephalus ephippium [57, 73]. In Lepidobatrachus spp., two or three medial shields arise during the larval stages in an antero-posterior direction from osteoblasts that in turn arise from mesenchymal cells within the hypodermis. In Ceratophrys cranwelli, there is a sequential addition of bony shield elements, beginning with the medial plates and progressing to the lateral and caudal ones that appear in advanced postmetamorphic stages . Among Ceratophryidae, only Ce. aurita, Ce. cranwelli, Ce. joazeirensis, Ce. ornata, L. asper and L. llanensis bear dorsal shields. It has been proposed that they evolved two or more times in the history of the family . These postcranial morphological traits of ceratophryids are homoplastic and, as already noted, are commonly associated with terrestrial/fossorial habits and resistance to desiccation in anurans (Fig. 1b). Consistent with that is the fact that Chacophrys and Lepidobatrachus are the only anuran genera solely endemic to the semiarid South American Chaco region . Furthermore, the presence of a cocoon as a mechanism to prevent water loss during estivation, even in Ceratophrys spp. from humid environments, supports the idea that the Ceratophryidae originated and diversified in a semiarid environment comparable to what occurs in the contemporary Chaco . The analysis of the derived characters in the horned frogs (Fig. 1), both in larvae and adults, and particularly those distinct to Lepidobatrachus, reveals many developmental changes. 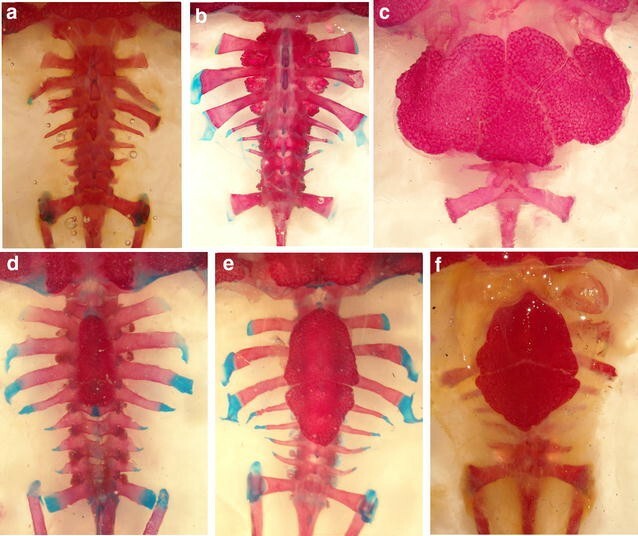 In Lepidobatrachus, new ontogenetic trajectories are associated with a wealth of anatomical structures associated with the organisms’ pre- and postmetamorphic feeding mechanism. These changes result variously from developmental variation that is recognized as heterochrony, heterometry, heterotopy, and heterotypy or some combination of these developmental processes (Fig. 3; “Appendix”). The occurrence of heterochrony, heterotopy and heterometry may be detected by comparisons between ontogenies and/or adult traits where these processes have consequences in the final shape. For example, heterotopy and heterometry are identified in adult Leptidobatrachus characters in which spatial relationships (e.g., nerves in relation to muscles) are distinct, or morphometric differences appear (e.g., allometry in lower jaw length, ossification of hyoid plate). Heterochrony may occur without morphological consequence in adult traits and requires developmental sequences for interpretations (e.g., sexual maturity). In contrast, heterotypy is observed in unique traits that have their own developmental sequence. Heterotypy, as a developmental phenomenon, is a new ontogenetic trajectory and represents an autapomorphy in a monophyletic lineage. In ceratophryids, the upper jaw bones bear non-pedicellate, monocuspid teeth (Figs. 1b, 9) that are differentiated and calcified in late larvae stages. At metamorphosis, they immediately become attached to the premaxillary and maxillary [62, 63, 75]. Such early differentiation and rapid calcification has similarly been noted for the non-pedicellate monocuspid teeth in the hyperossified Pyxicephalus adspersus  and pipids . Most anurans in contrast have pedicellate bicuspid teeth that appear at the end of metamorphosis with a persistent non-calcified zone that divides the crowns from the pedicels . The shift from the generalized anuran dental morphology to the ceratophyrid pattern fits with an early onset and accelerated rate of calcification of dental germs (i.e., sequence heterochrony). Although the lower jaw is toothless in anurans, enlarged upwardly directed fangs or odontoids are found in some neobatrachians, including the Ceratophryidae . Ceratophryid odontoids are robust and fully ossified, and flank each side of the mandibular symphysis (Fig. 10). In late stage larvae, fang germs, formed by dermal bone, are differentiated on both sides of the medial process of the infrarostral cartilage before the appearance of the lower jaw bones. During earlier metamorphic stages, the fangs fuse to the dentaries . In contrast to other anurans, where the odontoids constitute a laminar projection of the dentaries, in ceratophryids the fangs are ectopic ossifications integrated with the lower jaw bones having a distinctive developmental trajectory (i.e., autapomorphy, heterotypy, morphological novelty). Consistent with the unusually early hyperossification of components of the lower jaw, the postmetamorphic horned frogs appear to lack the separate and distinct mentomeckelian elements of most anurans that can rotate when the jaw is open to assist in tongue protrusion and retraction . One of the most remarkable features in horned frogs is the caudal placement of the articulation of the lower jaw up to or beyond the craniovertebral joint (i.e., heterotopy and heterometry). In Lepidobatrachus, the jaw articulation is far behind the craniovertebral joint [7, 50]. This provides them with an enormous gape. Indeed, ceratophryids, and in particular Ceratophrys and Lepidobatrachus, have about the widest mouth openings known in extant anurans. In Lepidobatrachus spp., the caudally displaced jaw suspension necessitates a shift in the position of muscles levatorae mandibulae. This, in turn, changes the muscles’ relationship with the branches of the trigeminal nerve (Fig. 11). In contrast to the arrangement seen in all other anurans, in both larvae and adult Lepidobatrachus, the muscles levatorae mandibulae are located behind the branches of the trigeminal nerve. This shift in the placement of the muscles and their nerves has been ascribed to heterotopy  (Fig. 11). Some features of the hyoglossal apparatus in Lepidobatrachus spp. can be derived from the condition found in Chacophrys and/or Ceratophrys . The hyoid skeleton of ceratophryids lacks anterolateral process, whereas the ossification of the posteromedial process is extensive with respect to other anurans (i.e., heterometry) (Figs. 1b, 12). In Lepidobatrachus spp., the hyoid plate is short. The hyalia are interrupted with short otic and hyoid segments, and there is an additional dorsal transverse ossification that is unique among anurans with a distinctive developmental sequence (i.e., autapomorphy, heterotypy and morphological novelty) . Skeletal deviations in the ceratophryid hyoid are concomitant with changes in the hyoid musculature implying reduction in the geniohyoideus, omohyoideus and petrohyoidei posteriores muscles  (Fig. 12). 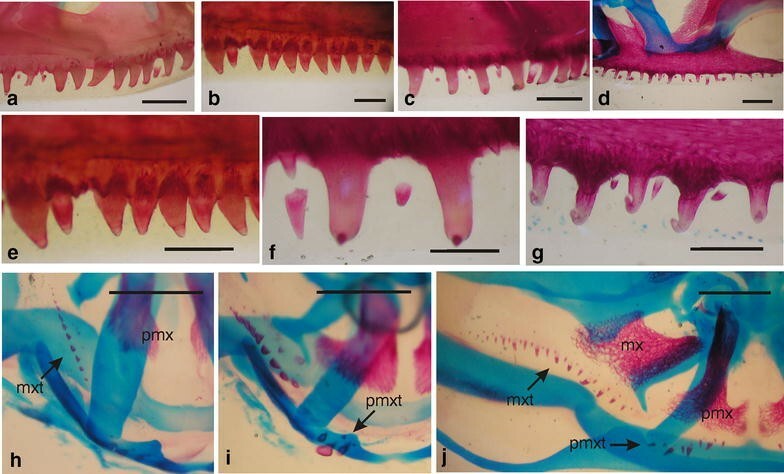 All of these features appear to be related to a global reduction in the ceratophryids of the tongue protrusion and retraction mechanism (see additional discussion below) compared with that of more generalized frogs, which feed on smaller and faster moving prey. The concept of morphological novelty (i.e., heterotypy and autapomorphy) refers to new anatomical features that may acquire new functions [47, 48], and two alternative pathways for the origin of such evolutionary novelties have been proposed . One pathway is the emergence of a new adaptive peak that could initially coexist with a preexisting one, which implies a change in role or function for a preexisting structure. The other involves the breaking of a developmental constraint that facilitates structural and functional integration. This would lead to a distinctive, viable and potentially unique morphology. Both processes evidently have occurred in the evolution of the Ceratophyridae and can account for much of their morphological diversity. Figure 13 depicts our interpretation of the evolutionary shift in the ceratophryid feeding mechanism away from the primacy of the tongue in prey capture, as seen in more generalized anurans. This involved the origin of morphological novelties and developmental modifications in ceratophryids for the capture of large prey. The fangs on the lower jaw, for example, appear to have evolved specifically to capture and subdue exceptionally large and active prey [25, 83]. They are integrated with other morphological traits to perform this new function. This includes the absence of pars palatina in the premaxillary, which allows the fangs to be contained within the inner face of the premaxillaries when the mouth is closed. 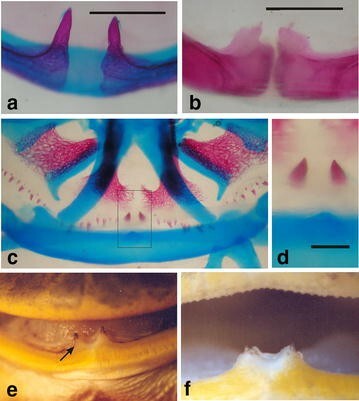 It also includes the development of an immobile mandibular symphysis and reduction in the number of fibers in muscles associated with the floor of the mouth and tongue protrusion mechanism (e.g., muscle submentalis, muscle intermandibularis, and muscle interhyoideus)—this reduction following the sequence Chacophrys, Ceratophrys and Lepidobatrachus . The upper jaw bears numerous spur-like and firmly anchored teeth for constraining resistant prey . Lastly, the caudal displacement of the jaw suspension has led to the most distinctive feature of the Ceratophyridae namely their enormous gape . Collectively, all these features in the horned frogs increase their ability, compared with that of non-ceratophryid hyloid frogs, to capture extremely large and active prey (i.e., megalophagy). The evolutionary shift in the Ceratophryidae toward feeding on such large prey may, in part, account for their high growth rates. The most extreme shift in form and function is seen in Lepidobatrachus. The genus has a number of unique features in the hyoid skeleton, such as discontinuous ceratohyalia and a dermal bone attached to the dorsal face of the cartilaginous corpus of the hyoid that has not been described in other anurans (Fig. 12). There is as well a reduced number of fibers in the buccal floor muscles, and muscles that attach to the hyoid are similarly reduced in L. llanensis and lost in L. laevis (Fig. 12). Reduction in the tongue increases room on the oral cavity to contain large prey. It is also true that, given the density and viscosity of water, prey capture with a projectile tongue is relatively inefficient. It appears that Lepidobatrachus has evolved a small tongue with simplified musculature as part of distinctive functional complex for aquatic suction feeding . This represents a new adaptive peak (Fig. 13). Notably the unique features related to feeding in Lepidobatrachus are similar in both the larvae and adults; both life stages are exceptional compared with other tadpoles and adults in their ability to subdue and ingest very large, active aquatic prey. Among ceratophryids, the increased developmental and growth rates affect all major organ systems of their larvae. Arguably, the most remarkable morphological novelties are seen in the visceral arches (e.g., the lower jaw, hyoid and brachial arches), which are essential for feeding in anuran larvae. Many of the derived features of ceratophryid larvae carryover past metamorphosis to the adults and are thus central to the overall morphological evolution of Ceratophryidae. Anuran metamorphosis is a constrained ontogenetic period regulated mainly by thyroid hormones (THs). Each tissue responds in a selective manner to TH, with varying degrees of sensitivity to the hormones, but in general metamorphic changes are coordinated and fast [87, 88]. Several studies have shown that TH have multiple effects on organisms and evolutionary changes may occur through physiological changes in tissue sensitivity to TH, which are manifest as heterochronic changes during development [89, 90]. Thyroid glands may themselves evolve. The thyroid glands of ceratophryid larvae show signs of low glandular activity without a manifest peak at metamorphic climax as is characteristic of anurans in general . In addition, different sources of TH or TH precursors from the tadpoles’ diet may influence their developmental and growth rates . Many of the heterochronic changes seen in ceratophyrids appear to be due to shifts in both the concentration of TH and TH tissue sensitivity. Figure 14 summarizes our interpretation of the origin of evolutionary novelties in Lepidobatrachus’s ontogeny in which shifts in metamorphosis have produced a dramatic and unique larval ecomorphology. The changes in development for the Lepidobatrachus tadpole have, in turn, influenced the adult body plan via a breaking of metamorphic constraints. The final result has been the origin of morphological novelties and the rise of a new adaptive peak. Anuran larvae have historically been classified into four morphological types reflecting intraordinal macroevolution [26, 92]. Other authors [36, 37], however, have argued that the Lepidobatrachus tadpole is unique enough to justify labeling it as a separate morphological type. Commonly in anurans, when there has been an evolutionary departure from the classic four intraordinal types, it is by the suppression of the larval stage resulting in anurans with direct development. The ceratophryids represent, in contrast, a case where developmental variation has favored a different departure from larval constraints. This has resulted in Lepidobatrachus having megalophagous tadpoles unlike the larvae of any other anuran genera. The Lepidobatrachus body plan and life style is thus built upon morphological novelties unique among the Anura. Despite the fact that the extant ceratophryids share numerous synapomorphies, and abundant molecular data have supported their phylogeny, they remain a monophyletic taxon with controversial in- and out-group relationships. In part, this reflects the fact that there are new structures in the Ceratophryidae that have no homology in their ancestors (i.e., autapomorphies, heterotypies or morphological novelties). The ceratophryid frogs represent an excellent model to elucidate phenotypic variation through ontogeny, and witness the many ways that heterochrony, and the breaking of developmental constraints, can yield ecomorphological novelties. The influence of this ontogenetic variation is most pronounced in the genus Lepidobatrachus. Indeed, because of its large size and rapid development, Lepidobatrachus laevis has recently been proposed as a model species in experimental studies undertaken to address a wealth of classic questions in amphibian embryogenesis . Furthermore, because of its sympatry with several other ceratophyrid species (in the Gran Chaco of South America) and its well established phylogenetic relationship to those species , Lepidobatrachus stands out, not only as model species for studying developmental processes per se, but exceptional for studying the very evolution of those processes. MF conceived, designed and performed this revision and wrote the manuscript. SIQ participated in many studies about the morphological variation among ceratophryids and contributed with interpretation and discussion on patterns of heterochrony and heterometry. She also participated in the design and helped to draft the manuscript. JG contributed with interpretation and discussion on patterns on growth and development in anurans and helped to draft the manuscript. JCC is doctoral student in the laboratory of MF studying developmental variation in thyroid glands in anurans and provided data on ceratophryids. MCP is doctoral student in the laboratory of MF studying developmental variation in postaxial skeleton in anurans and participated in discussion on habitat and lifestyles. RJW contributed with discussion and interpretation of data and wrote the manuscript. All authors read and approved the manuscript. This work was supported by FONCyT PICT 616 and 510 to MF, FONCyT PICT 2718 to SIQ, CONICET PIP 497 to MF and NSERC Grant to RJW. Glossary of major terms used in the literature to discuss the evolution and development of morphological structures in vertebrates. The numbers in brackets refer to the key papers cited for definitions of these terms. Adaptation Any feature that promoting fitness and was built by selection for its current role . Apomorphy A character hypothesized to be uniquely derived for a particular monophyletic group . Autapomorphy Any character hypothesized to be uniquely derived for a particular monophyletic terminal taxon . Developmental constraint The difficulty or impossibility of producing certain variations from a given starting point . Developmental drive The ease of producing variation in development in particular directions, opposite and complementary, to developmental constraint . Evolution Unidirectional (non-cyclic) organic change through multiple generations . Evolutionary novelty New structure, new function, new adaptive niche [47–49]. Exaptation Any feature that now enhances fitness but was not built by natural selection for their current role . Growth heterochrony The occurrence of developmental changes in the relationship of size [42–44]. Heterochrony (other timing) Change in the developmental timing for a part of an organism with regard to the time for development of that part in the ancestral ontogeny . Heterometry (other amount) Change in the amount (in size or proportion) of some part of an organism with regard to its proportions in the ancestral ontogeny . Heterotopy (other place) Change in the anatomical location of a structure in an organism with regard to the same part in the ancestral ontogeny . Heterotypy The absence of any shift in the time of appearance, location or proportions of a structure in a current organism compared with the ancestral ontogeny . Hypomorphosis/hypermorphosis Evolutionary processes producing interspecific changes in growth rates with consequences in adult size . Homology Structures having the same origin, position, shape or composition in two or more organisms . Homoplasy Incongruent data which, on grounds of parsimony, cannot be explained as homology (i.e., as due to common ancestry) . Morphological change Any variation between the same kind of building blocks (i.e., organs, tissues or cells), among individuals or between species . Morphological novelty A new structural element in a body plan that has no homology in the ancestor or in the same organism (serial homology) [47, 48]. Natural selection Differential survival of the variants across generations . Ontogeny Developmental trajectory (series of forms) of an organism from its starting point to maturation . Paedomorphosis/peramorphosis Evolutionary processes producing interspecific changes in developmental rates with consequence in the adult shape . Parsimony Methodological tool to select the preferred hypothesis based on the fewest assumptions about a data set . Phylogeny A pattern of evolutionary relationship between three or more taxa [38, 39]. Sequence heterochrony As the developmental trajectory is conceptualized as a series of discrete events, sequence of heterochrony is demonstrated when the temporal position of an event changes relative to other events in that sequence [42–44]. Synapomorphy A trait shared by all members of a monophyletic group set .